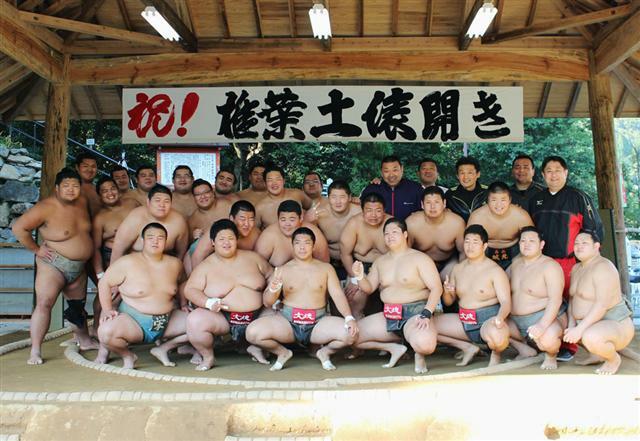 A commemorative photograph taken in Miyzaki after a sumo youth tournament. 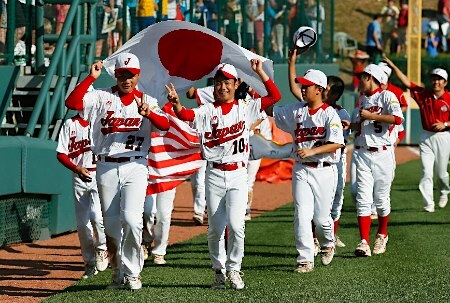 The former grand champion Takanohana is third from the right in the rear. 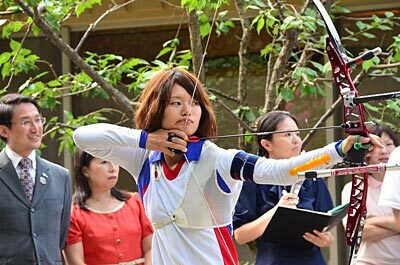 To follow up yesterday’s photo of three archer/samurai, here is Kawanaka Kaori of Tottori giving an archery demonstration at the prefectural governor’s residence last month. She was a member of the Japanese women’s team that won a bronze medal in archery at the London Olympics this summer. LOTS of folks enjoy testing their strength, whether in Olympic weightlifting, the grip strength machines at beachfront boardwalks, or the annual Chikaraishi Soja at Soja, Okayama. 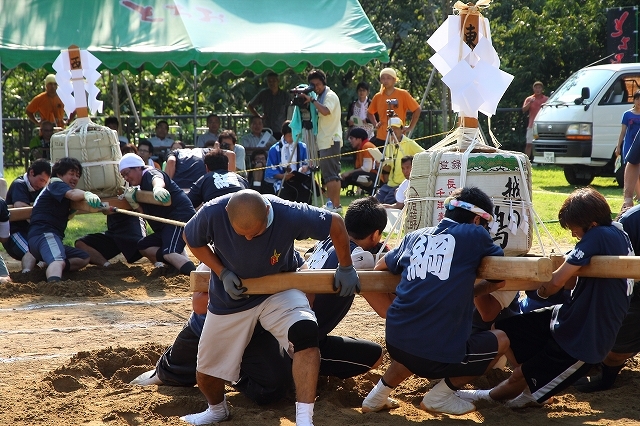 In that last event, men and women of all ages squat down and lift rocks and concrete blocks in the yard outside the Soja-gu Shinto shrine, competing to see who can hold the pose the longest. The heavy lifting happens every year at the end of August, and this year about 200 people showed up to spit on their hands and heave away. There are 23 different weights ranging from 1.9 to 180 kilograms, which allows anyone of any age to muscle up and go. The idea is to lift it the stone 10 centimeters off the ground and hold it for 10 seconds. After that, the person who holds on the longest wins. 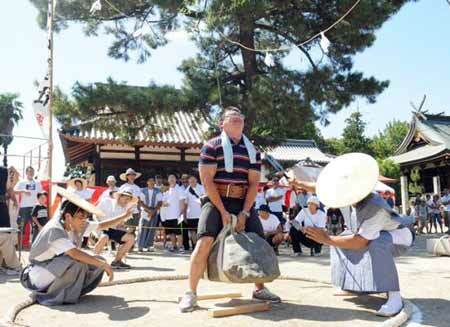 One 74-year-old man was an inspiration for us all by successfully lifting and holding a rock weighing 135 kilograms. That’s about 50% more than I weigh. The event isn’t a casual neighborhood affair, either. 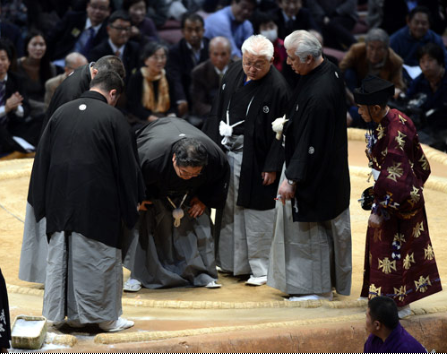 The male champion was Sugimoto Katsuhiro, a civil servant who came over from Kashihara, Nara. He’s won two years in a row, five times in all, and holds the holding record at 59.55 seconds. 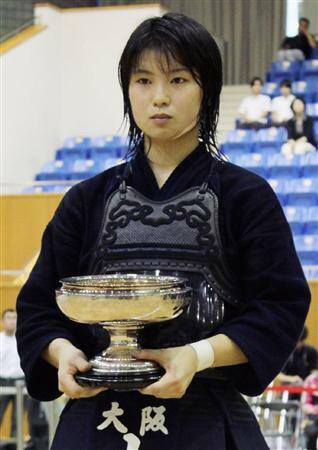 The women’s winner was Mitsuhata Akemi (31), a temporary employee at a local junior high. She stood up and held on to a 120-kilogram rock to win for the fifth straight year and 12th time overall. The city of Soja has posted several pleasant Youtube videos to promote tourism, and here’s the one with scenes from last year’s event, including Mr. Sugimoto’s winning hoist. You might break into a sweat just watching it. 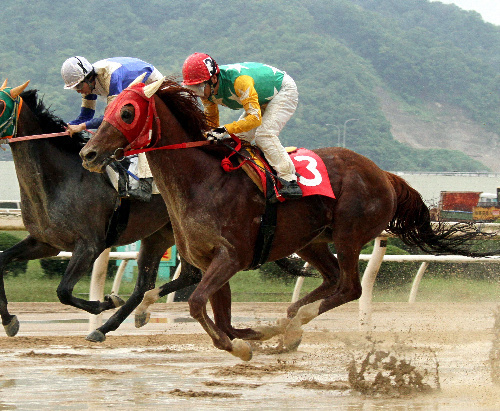 THE middle-aged star of the regional horse racing circuit in Japan, Monakukabakichi, a 13-year-old male running out of the Fukuyama Municipal Track in Hiroshima, has hung up the silks and called it a career. He retired — or rather, his trainer retired him — after 55 wins. That’s a national record. The track announcers should have gotten hazardous duty pay for having to say that name quickly when calling races over the past decade. As with many aging athletes, the big guy could no longer overcome his physical problems. He finished sixth in his first race after setting the record last month, and the trainer decided that was that. His owner thinks it might have been due to all the fatigue that emerged after his prodigious win total. And to put it in perspective, he’s 50 years old in human terms. He must have been quite the magnificent specimen of horseflesh. You’d think they’d want to create as many opportunities as possible to pass those genes into the future, but reports say the owner is thinking of sending him to a riding club for the rest of his days. What? After years of record-breaking service, he’s being deprived of the chance to live on a stud farm? Retired baseball and football players in the United States have special associations to look after their interests, but if no one takes up for Monakukabakichi, he’ll be nothing but an upscale beast of burden. Is that any way to treat a star? Peter Singer would call that speciesism. Here’s another red horse: the Red Horse Band. Be patient through the first minute and a half as they chat with the audience (or advance the video cursor). They’ve got a unique thing going. The percussionist also plays shakuhachi. 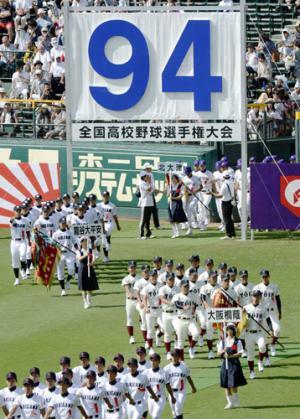 The opening ceremony for the 94th National High School Baseball Championships at the Hanshin Koshien Stadium in Hyogo. 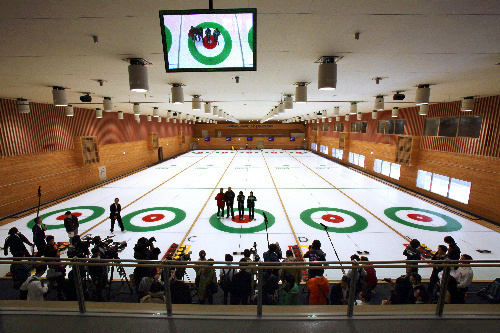 It is an elimination tournament, which means that the eventual champion will have won every game starting at the prefectural championship round. 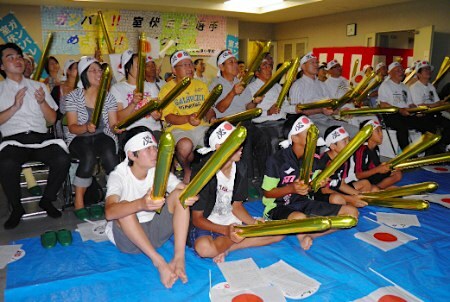 Fans in Miyoshi, Aichi, stayed up late to watch hometown boy Morofushi Koji win a bronze medal in the Olympics for the hammer throw. He won the gold medal in the same event in Athens in 2004. THE combination of the hypernationalist undercurrent endemic to the Olympic Games and the two-ton chip on the Korean shoulder almost guarantees the emergence of a certain attitude familiar to those who live in Northeast Asia. The following newspaper article appeared in the Japanese-language edition of the Joongang Ilbo this morning. (Many Korean newspapers translate some of their articles for Japanese-, English-, and Chinese-language editions.) Here it is in English. Please keep in mind that most of it is going from Korean to Japanese to English, and the soccer manager’s comments are going from English to Korean to Japanese to English. Great Britain’s team in Olympics men’s soccer has again wounded the pride of the South Korean team coached by Hong Myung Bo. Early in the morning of the 3rd (Korean time), Great Britain’s manager Stewart Pearce continued his dialogue with the British media at an official news conference at Cardiff Millennium Stadium that had the nuance of ignoring South Korea. The news conference was about the quarterfinal round, but no questions arose about South Korea. The only questions were about those that had no direct relationship with the next match, such as the significance of playing with a unified British team (it combines players from England and Wales), the meaning that appearing in the Olympics has for the younger players, and the potential for a medal. Watching this, the South Korean media could not remain indifferent, and asked the British manager to evaluate the South Korean team that his team would be playing in the quarterfinal. It was the first time that Pearce opened his mouth, and it was clearly lip service. As if he had been waiting for the question, he was enthusiastic in his praise for South Korea. But his attitude changed when he was asked to select a South Korean player that should be marked in particular. With a somewhat confused expression on his face, Pearce said, “I know South Korea only as a team. I am not as familiar with the individual players.” It was a string of excuses that didn’t rise to the level of excuses. It isn’t only Pearce. The overall atmosphere of British soccer is much the same. They seem to be more concerned about whether they will beat Brazil, who is likely to be their opponent in the semifinal match, rather than South Korea in the quarterfinal match. 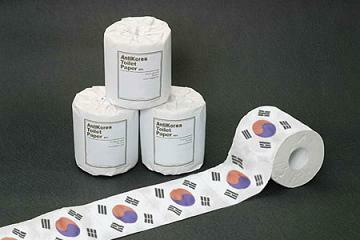 The objective of the South Korean team is not only to win their first soccer medal ever in the games. A compelling situation has now arisen for a victory to take down a peg soccer’s colonial power that disrespects South Korean soccer. However, it turned out that Korea is not in position to blame the other teams as Ha and Kim apparently tried to throw a match against Jauhari and Polii of Indonesia. 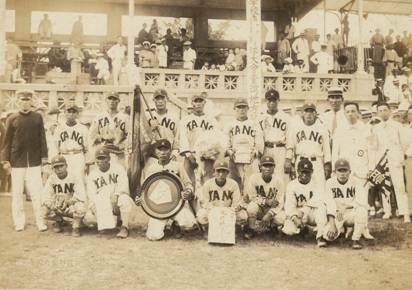 The two teams also purposely gave up points and made mistakes in an attempt to avoid world No. 1 Wang and Yu in the quarterfinals. Some local badminton officials said that the Korean team’s actions weren’t proper, but they could understand why the badminton crew committed such an act since getting good results matters at the Olympics. 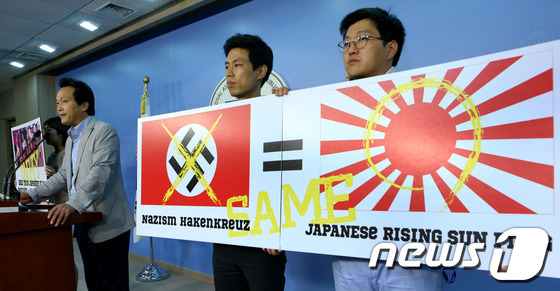 And some people wonder why Japan has a difficult time establishing stable diplomatic relations with South Korea. To those who wonder if the tone of Japanese newspapers is the same, I offer this from 2008. 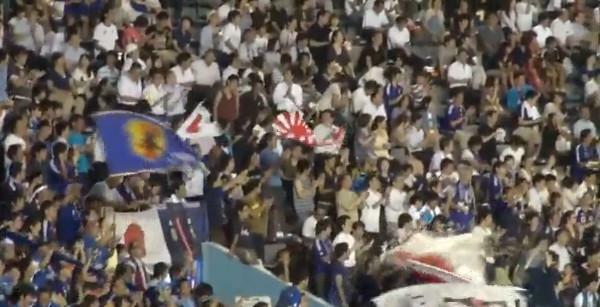 They get excited about soccer in South Korea.